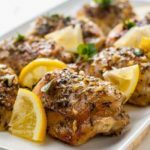 This Easy Baked Lemon Chicken recipe is . . . easy! Heat olive oil with garlic, lemon juice, wine and herbs, pour into the bottom of a baking dish and set the chicken on top. Spoon some of this seasoned oil on top of the chicken and bake! Prepare the sauce. Gently heat the olive oil in a small saucepan over low heat. Add the minced garlic and heat until tender but not browned, about 1 minute. Add the wine, lemon zest and lemon juice, oregano, thyme, salt and pepper and stir. Remove from heat and pour into a 9 x 13 inch baking dish. Rinse the chicken and pat dry. Place skin side up in the dish. Spoon some of the sauce over top to coat completely. Slice the lemon and tuck it in, skin side down (otherwise it will scorch) between the chicken pieces. Bake for 30 to 40 minutes, (less for boneless breasts) depending on the size of your chicken pieces. Check for doneness. If the skin isn't crispy, place the dish under the broiler for 2 to 3 minutes until browned. Remove from oven, cover with foil and let it rest for 10 minutes. Spoon some of the sauce from the bottom of the dish over the chicken just before serving. I updated this recipe slightly from the original by reducing the amount of olive oil required to 2 tablespoons.